How is it you can make incredible fried chicken without frying it in hot oil? The secret is in the sauce…using a SMALL amount of butter and BAKING the chicken. 1. 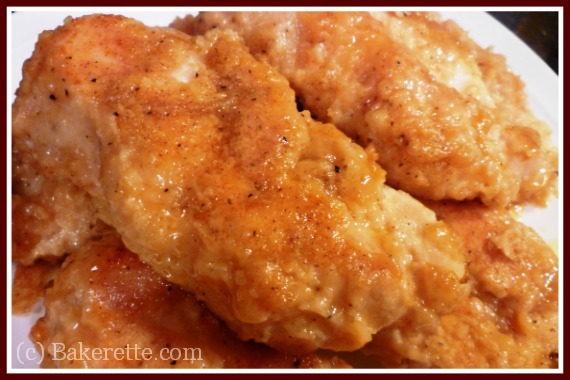 Place thawed chicken strips in a bowl of buttermilk, cover, and let soak 20-30 minutes in the refrigerator..
3. Combine and mix thoroughly flour, salt, seasoned salt, pepper, and Paprika in a gallon-size Ziploc bag or bowl. 4. Cut 1/2 stick of butter into a few pieces and place in a 9- x 13-inch pan. Melt butter in preheated oven. 5. Spread melted butter around the bottom of the pan. Lightly spray the pan with cooking spray, if needed, to make sure that there are no dry spots. 6. Shake excess buttermilk off chicken and completely coat each piece in flour mixture. Either shake in the bag until coated or dip each piece in the bowl until coated. 7. Place each piece of chicken in the preheated pan. Bake for 20 minutes. Turn each piece of chicken over and continue baking for 20 minutes more, or until cooked through.